I saw a Better Together referendum broadcast on the BBC last night. It was full of proud and patriotic Scots proudly telling us how proudly proud they were to be proud and patriotic Scots. We’ve got lovely scenery you know, and they were all dead proud of lots of other stuff that’s never going to change because it’s already happened, like things achieved by people who are long since dead. The video featured that lovely wummin that retweeted the oh so funny wee joke that Catholics are like Christmas lights because they’d look better hanging from a tree. So that’s just patriotic and Cool Britannia then, in an Orangey grassroots way. And oh so very proud she was. Alicsammin doesn’t know what a joke is. Britishness is so inclusive isn’t it. And the ordinary mum who just happens to be the chair of her local Labour party was there as well, being proudly and patriotically grassroots too. And some wee manny, being proud in Gaelic, proudly proud of a Union that’s killing his language. They were all proud of a Union that’s dead, a partnership that’s a takeover, an equality that’s subordinate. Proud of a Union that tells us we have no right to anything. They’re proud of the ball and chain that restricts their freedom of movement. Proud to surrender their choices to others. We’re better together because then we don’t need to accept any responsibility. We can remain children. We can remain like the cygnets in the pond in the park and think that the world is bounded by the fence. Ugly ducklings forever. It was all a bit desperate, over-compensation. The only people you should ever need to tell how proud you are are the people you are people of. But the people the ProudScots are proud of are all dead. They’re proud of the dead because they can’t be proud of the living. So they stress how proud they are, to cover up the vanishing dignity, the evaporating hope, the death of aspiration. The essence of Unionism is being proud of the dead and the inanimate. Perhaps it’s safer that way. It’s a passive pride, a pride that stands on the dignity of others, without a sign that you might dare to imagine that you could make people proud of what you could do yourself. Or that you might be proud enough to dream of what the people of Scotland could do together as a nation, not in the past but here and now. You might dare to think that pride is about an active present not the passive past. But an active Scottish pride is a dangerous pride. The ProudScots keep it safe and quiet, they’re proud of the scenery viewed through the window of the coach as it winds its way through a the estate of an absentee landlord in a landscape denuded of humanity. All aboard the ProudScot tour bus. There was enough chest expanding pridery on display to inflate the egos of a pride of Unionists – that’s the official collective noun for them, in case you were wondering. They like to think that they’re the British lions. Did you know that lions eat their young and turn on the sick and wounded? True fact that. And most of their food is stolen from hyenas and other far more successful hunters. ‘Nother true fact that. I don’t much fancy being a proud British lion, it’s just a less successful hyena with better hair. Hyenas have more laughs anyway. But I’m proud too, proud enough to know that things should be better than this, proud enough to dream of a country that doesn’t just mouth justice but practises it, proud enough to do something about it. And proud enough to understand the difference between being proudly self-regarding, and the pride others could have in you. Today the doctor called from the hospital. We spoke about the pride and dignity of a beloved man whose life is slipping away. She needed to know if she should strive officiously to keep my partner alive. Sometimes the ones you love are so broken and worn out that you need to let them go free. She wanted me to know that the time for a decision is approaching. It’s not here yet, but it will be soon. He’s not coming home again. So I watched the proud Scots being proud of having no answers, proud of the certainty of lack of faith and ambition, passively proud of the past. They live in a broken dream but are too afraid to let it go, blinded by their own passivity and pride they can’t see it can never be fixed, can never be healed. So they distract themselves with currencies, alicsammins and cynicism. They don’t want to face the decisions that face us all. The decisions required to take charge of your own life by yourself. It’s too hard, too frightening. So they retreat into denial, it’s all good, it’s all just fine, look at the dead and be proud. No future just a present that looks to a past that’s vanished. But the time to let go is coming. Be brave. Face the fear. Accept it. And life will go on and you’ll discover the strength within you. The strength you can’t see because you’re too busy looking at the past. I went to the park with my friend Mary and the dug to feed the swans. 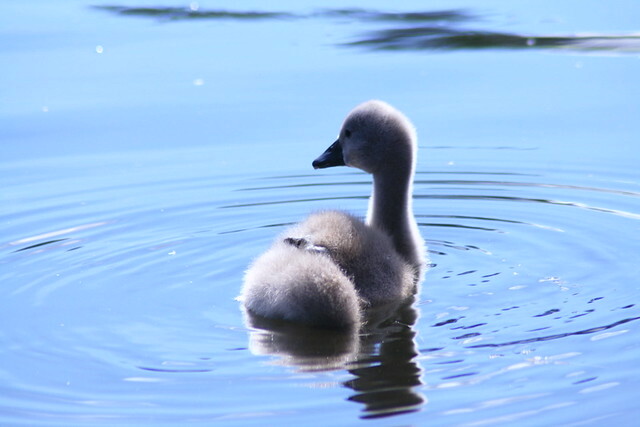 I had some Yes cakes left over from Friday, and on the basis that you are what you eat, I fed them to the cygnets in Alexandra Park and imagined they will grow up into Yes swans. They’ll leave the safety of their wee pond and will fly off to recolonise a loch in a Highland estate long since cleared of human beings. The swans will do what the people can’t. They’ll fly free. Swans start out life as ugly ducklings, and then grow into graceful and elegant creatures, who can be right nippy wee buggers if you cross them. They take to the skies and find their own paths and soar above the proud lions, the imagination flies free. And they don’t care what anyone thinks of them. Scotland can fly free and find her own path, in grace and beauty. I want to be proud like a Yes swan. Thank you Paul, and our thoughts are with you. Beautiful piece. Oh Paul, thoughts with you at this difficult time. My Dad was asked the same by the doctor’s regarding my Mum who, in later stages of Alchziemer’s, had suffered a stroke. He told them ‘ thou shalt not kill but neither should you prolong suffering when there is no hope ‘. Sending you strenght. Let us set Scotland free for them. Sorry to read that your partner is not coming home and thank you for continuing to write inspirational pieces during such personally difficult times. Many of us out here look forward to your articles and send them far and wide. There are lots of people who will be thinking of you at this time and hoping for the best outcome for all concerned. Lovely words Paul, hard times doesn’t even come close to what you’re carrying around. Good luck and stay brave dude. Damn keyboard is full of dust again. I am so sorry – I hope you do have peace these coming weeks. I can’t say better than to repeat Stuart Black ‘ Beautiful, thank you, my thoughts are with you’. Once again Paul, you put into words what many of us have in our minds as disorganised thoughts. When my mother was dying, a good friend of mine, a former Catholic priest, told me that when a fruit is ripe, it falls from the branch. This helped me come to terms with the inevitable. I pass this on to you in the hope that it will help you also. You are in our thoughts. Keep taking the dug out! From the heart as usual Paul. You are inspirational in your sadness but keep faith in Andy’s dream of living in Scotland, with the dug and with independence gained. It will happen! Anything i say is not going to make things any easier for you but my thoughts are with you.Keep blogging as you are a massive inspiration to the Yes campaign. I think you have converted a few doubters as well as a few No’s. Thank you Paul for your beautiful article. Your heart and courage are inspirational. There you go, getting somebody’s face wet again, pal. I know I speak for all of us when I say you’re both in our thoughts. And still you can channel positivity out there to us in a piece that I find very relevant in a personal context this week as you know. What writing! Scathing, achingly sad, brave and full of hope. Aye Paul and we are proud of you. Stay proud and strong. We really are in the early days of a better nation with guys like you. Enjoy this song, written for this very time. That is so full of sadness and hope at the same time, I don’t know whether to cheer or cry. That is the most inspirational piece of writing I’ve read in a long long while. Your are both in my thoughts. At parting than at meeting be.. Thank you Paul for your courage and your clarity. So sorry to hear that Andy is not going to come home. But his home is already in your heart. Thanks for the great new collective noun – “a pride of unionists”. I’ll enjoy using that on the BT page, even if it does get me banned. Emotional rollercoaster, beautifully written. Our thoughts are with you. Oh Paul. Just, oh Paul. Paul, thank you for that beautiful piece at this most trying time for you. You are an inspiration to all of us. You are the first message I look for each day. so sorry to hear of thiis and all best wishes and love to you both. Ye another inspiration piece of writing well done. My thoughts are with you and Andy. The link between your personal life and the political one is poignant. In my experience of life and death, dignity trumps pride. Be gentle with yourself, you are well thought of in this corner of the internet. Humbled by your article and so sad for you both. Our thoughts are with you. Swans are often used to symbolise the Nordic countries, so the swan would be a very appropriate symbol for an independent Scotland that wants to join the Nordics. Saddened by your news yet inspired by your writing which seems to be more and more from the heart with every post. Sarah and I both wish you both the very, very best. I don’t really have the words to express how much your post touched me. I hope with all my heart that the man you love lives to see a free Scotland. Inspirational and heart-breaking. My thoughts are with you both. Many thanks for your open honest insightful and funny posts, you are a national treasure, you are very much appreciated and keep blogging. If Paul’s post was inspirational (and wasn’t it! ), the many replies were touching and heart warming – the kindness and compassion of the ‘Yessers’ soars above the gross, sectarian bile of the repulsive, and extreme Naysayers. Suas leish na h’Alba- bu choir! Thank you again for your inspiration, and your words which illuminate so eloquently both the fragility and the strength of the human condition. My heart goes out to you, and I wish you peace, love and light…..for the coming days…. There’s not much I can add. It’s a strange parallel that as Andy deteriorates and hope diminishes so your writing inspires and flowers at such an important time. You are not alone in having those conversations and I think you knew just how the land lies. I wish you both peace from pain and sorrow. You have stirred a lot of people just at a critical point in the history of our country. I am certainly grateful for your contribution. it has made the debate about the people not the dry politics of the main stream media. A truly wonderful piece of writing, made even more stirring when taken in consideration of the situation you and your much loved partner Andy are living through at this time. These writings’ will be saved and revered by future generations of Free Scots’. Wishing you, Andy and The Wee Ginger Dug strength and renewed succour in the coming weeks. It’s very hard for you just now, Paul, coming to terms with the fact that Andy wont be coming home, just watching helplessly as life ebbs away. We’re all here for you and will give you our love and support to see you through this. Whilst some may think how difficult it must be for you to keep writing for us at this time, I realise that this is your way of working through what’s happening in your life just now. Just know that we are here for you and thinking of you and of Andy. Thank you for taking time out from your private grief to keep us all buoyed up in this final stress inducing straight. Independence has always been our hearts’ desire but now we want to gift it to you. You’ll never know what strength we’ve drawn from your exquisite writing. Thoughts and prayers are with you both. Hi Paul – been there myself and so have some idea of what you are going through – and it’s crap. But it’s clear through all your posts that you’re a man of compassion and conviction who is not going to walk away from the challenge that life throws at you. Your contribution to the righteous cause of Yes cannot be underestimated. It’s folk like you that have given me the strength and courage to put my head above the parapet and not give a toss about the risk of being shot. Swans mate for life. A Yes vote is for life. The word swan mrans to sing. Vote Yes and let Scotland sing. I will always think of Andy when I see a swan fly free and high. I think you write of hope – and none of us will ever forget this amazing journey we have had with you. I’m amazed how you can come out with such inspirational posts at this difficult time. Thinking of you and Andy. I have tremendous admiration for you and your ability to sculpt the written word. I don’t have your gift. I can only say I’m so sorry you have this pain to go through at this time. The swans will come and take your Andy when the time is right. He will sour away with them but his heart will always be yours. He will meet up with all the people I have loved and lost, all the people that were proud of me, just because I was their kin. Love never dies. My thoughts are with you and Andy, Paul. I have followed your blog for some time now and been too shy to comment, but this post which is both funny and utterly devastating at turns prompted me to want to let you know how thoroughly appreciated your writing is. While broadcast and print media let us down, you manage to take the keech life throws at us and turn it into literary gold. I don’t know how to comment on what you are going through other than to say my thoughts are with you at this heart wrenching time. Your writing has stirred hearts and minds and I believe the quality of thought, compassion, humour and inspiration you provide is prophetic of what Scotland can become. Here’s to Andy’s dream coming true and to the inspirational role you are taking in making it happen. I hope ‘M’ doesn’t mind me endorsing their comment as they have expressed what I would like to have said. My thoughts are with you Paul thank you for continuing even though you are hurting. Thoughts with you, Paul. Thank you for your fine writing and thought-provoking blog. That was beautifully written; it’s really shed light on the ‘why’s of these proud Scot’s empty rhetoric for me. I came to cynical conclusions on my own, but your poignant suggestion has made me rethink. Thank you for that – I think I may engage with my peers and face the barrage of misinformation feeling that my frustration is more tempered now. Thinking of you and Andy. It must be bittersweet knowing that you are gaining your nation and losing your partner. I didn’t realise the collective noun for unionists was a pride. I thought it was a condescending of unionists. You will never be alone with your writing, so many that read and are inspired by your words will be at your back, supporting you in spirit if not in person through these hard times! I hope and pray our Nation take and use the courage, inspiration and compassion you give them! I wish I could think of something even more uplifting to say, but I can’t…. We are heartbroken for you. This should not have come to you so soon in life So sorry. My heart goes out to you and I send a hug too. Thank you Paul – a beautiful piece. On the subject of collective nouns, I think in view of their colonial mindset, an alternative description is “a poke of Brit Imperials”. Love your blog, please see that this article – http://www.theguardian.com/politics/2014/aug/20/scottish-independence-referendum-english-attitudes – gets as much airing as possible. Absolutely – no going back – not now, not ever. Yes as a movement must and will continue long after September 18th dust has settled. Thinking about you and yours. Our thoughts are with you, Paul, at this heart-breaking time for you. You have given all who read your blog so much, in words beautifully and funnily expressed, but now there is little we can give in return except inadequate words of support. You have made us all proud like Yes swans, and hopefully come 18th September we can all fly towards independence. Hugs from us all. I can only add to what many have said above; it is clear your writing is wought from a deeply compassion heart. You have a capacity to transform the powerful unwieldy elements of emotions into exquisite prose…the depth, the feeling and the meaning instantly transferred to others. You know what communion is Paul, in this sense; the act of sharing, or holding in common; participation. You allow all of us to share with you…and by this process our hearts connect. Scotland’s heart is connecting all of us. I feel your pain, that is what love is, you are not alone. I have not got much time on my hands for commenting right now but I am reading every word. I wanted to say that you and yours are in my thoughts and I hope for a good outcome. Wishing you sympathy and thanks from a fellow Scot in Calgary, Canada. Another heartfelt post bursting with both hope for the future and personal sadness; once again I have tears in my eyes. My thoughts and prayers are with you and yours Paul. Please take succour from all the posts above and know that you and your family are loved by many, many people. I find that each day when I read your blog I come away reinspired with a fresh breath of air. My wife died young after battling with cancer and at the end, death came as a blessed relief to both of us. You realise then that there comes a time when to let go is the right thing to do. I and two fellow Yessers were trying to get through to an unthinking No supporter in the golf club bar today. It was like battering our collective head against a brick wall. The barmaid was also No. I shook my head in despair. The only consolation is that probably neither of them will bother to vote. Stay strong, thousands are holding you in their hearts in this difficult time, peace to Andy. After I sent ‘Carntyne in the rain’ to many people all over the globe I felt a pride but not one of the Lions style. Pride anew in silly little things like my accent, pride in my long ago education. Pride for my thoughts of this dearest of lands future. So with this little story I will do the whole sending to friends and places thing again. I think though that they all are readers in their own right now. So I beam with pride for that. Thankyou so very very much, I’ll bring your attention to Hamish’s words, perhaps our new anthem and a beautiful old pipe tune …… https://m.youtube.com/watch?v=PSV-wcgM6jo. Our thoughts are with you. Over here in East Lothian, Whooper Swans sit in the fields in winter time. They’ll now remind me of this post, your affection for Andy, and all our hopes for our country, for many years to come. Much love to you both at this tremendously difficult time. Over here in East Lothian, Whooper Swans sit in the fields in winter time. They’ll now always remind me of this post, your affection for Andy, and all our hopes for our country. Have my shoulder to lean on and my hand to hold.